On a hunt for chocolate covered strawberries, we met a fellow small business owner who has a local catering company and a delightful cafe. Once we tasted some of her delicious food and learned that she makes creative long-stemmed, hand-dipped chocolate covered strawberries, we knew we needed to look no further. 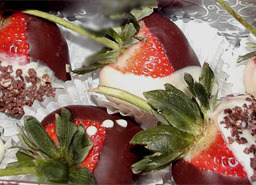 We’re excited to add these wonderful strawberries to the list of things you might like to enjoy while staying with us. We also met the local chocolatiers and we were so impressed with their creativity and love for what they do that we now offer their company’s gourmet truffles for you to enjoy as well. With choices such as Coffee Caramel, Peanut Butter, Lavender, Raspberry Almond and Cappuccino (just to name a few) you can’t go wrong with these heavenly little pieces of chocolate. Switching gears a bit — several of our guests arrive in great anticipation of doing absolutely nothing while they’re here. They’ve had a stressful week, maybe even a stressful month or year, and they’re very much ready to get away from the rat race for a while and find peace. Other guests come with 4-page itinerary in hand, ready to do as much as possible in a short timeframe. No matter what category you fit into, a massage is a great thing to add to your stay. Looking to de-stress and relax? Answer: Massage. Been hiking, walking around, driving, shopping ’til you drop and now the muscles ache? Answer: Massage. We’ve found some talented massage therapists who are trained in a variety of massages, from relaxation massages to deep tissue, from swedish to thai. Aromatherapy massages. Couples massages. Sounds nice, doesn’t it? Strawberries. Chocolate Truffles. Massages. Just some of the great things we’ve discovered that we’re happy to share with you. You can find more on our packages page, which we update periodically with new discoveries for you to enjoy. This entry was posted in Uncategorized and tagged food and drink, improvements by Inn on Mill Creek. Bookmark the permalink.